Across the Continent, Lithograph, Frances F. Palmer, 1869. During the Civil War, Missouri and Tennessee were claimed by both the Union and the Confederacy. The Union dominance in each of these states was achieved by a difficult struggle on many fronts, and my great-great-grandfather William Ivans (1842-1908) lived through the most terrifying years of the war in these two states. He served for almost the entire duration of the war before emigrating to California as part of a new age brought about by technology. It is not clear exactly where William Ivans was born or raised. He was certainly born in Tennessee, probably in February 1842.1 But considering the explosive environment in Tennessee as he came to age, whether he was living in Western, Middle or Eastern Tennessee would have made a huge difference in why he left the state. His parents were William Ivans and Easter White, both also born in Tennessee.2 But census or other records of this couple have not yet been discovered. This suggests that young William did not live with his parents, perhaps due to some tragedy. 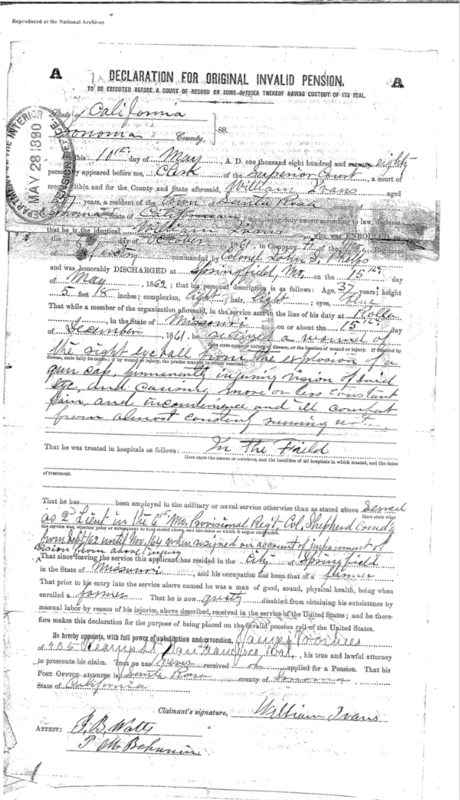 The location of this record, in Greene County, possibly places a young William in East Tennessee, which may help to explain the trajectory of his later life. 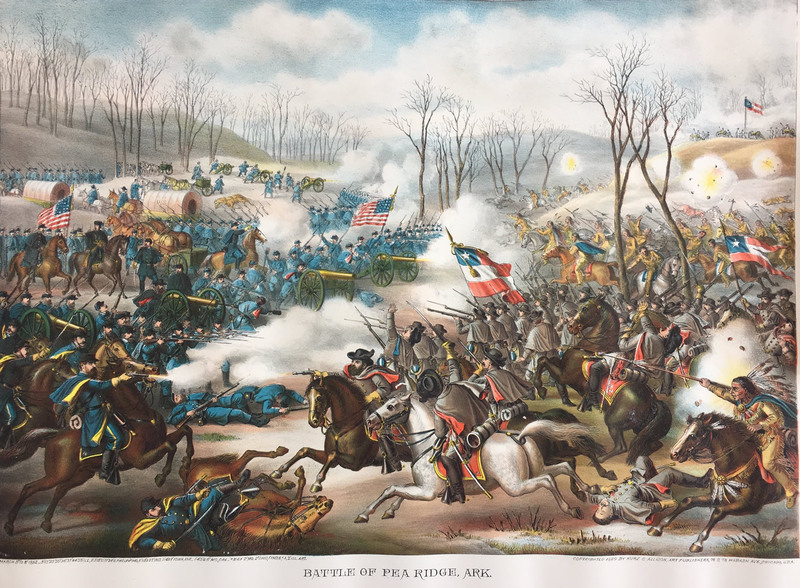 Because if William came of age in East Tennessee, his environment would have played a major role in his decision to fight with Union forces against the Confederate States of America. When South Carolina seceded from the Union in December of 1860 in order to maintain the “peculiar institution” of slavery,5 and subsequently launched an attack on the United States at Fort Sumter on 12 April 1861, it set in motion a process whereby each Southern state would have to decide whether to remain in the Union or join the Confederacy. Tennessee was hopelessly divided on this question. Tennessee was carved out of South Carolina in 1790 as the Southwest Territory. Six years later it was admitted to the Union as the 16th state, and many residents of South Carolina emigrated to the new state to take advantage of the vast expanse of free farmland, much of which was basically stolen from native Americans. 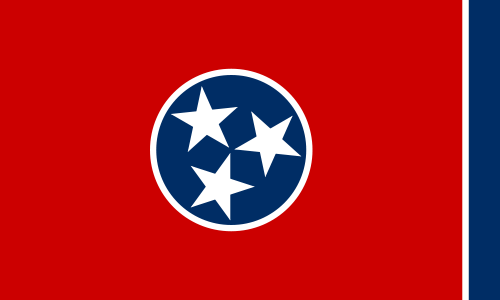 The state flag of Tennessee has three stars representing the three regions of Tennessee, unique among all states in that these regions not only are different in culture and geography, but are also constitutionally recognized as separate and distinct parts of the state, known as Grand Divisions. East Tennessee is a mountainous region within the Appalachian range. At the time leading up to the war, there were virtually no slaves, and this region was strongly pro-Union. Its major cities are Knoxville and Chattanooga. Middle Tennessee is characterized by great flatlands called the Cumberland Plateau. This region was almost evenly divided pro- and anti-slavery sentiment. The current capital, Nashville, is in this area. West Tennessee was sparsely populated, but most of the homesteaders had brought slaves with them to work on large farms. This area was a hotbed of ardent Confederate support. Its major city today is Memphis. 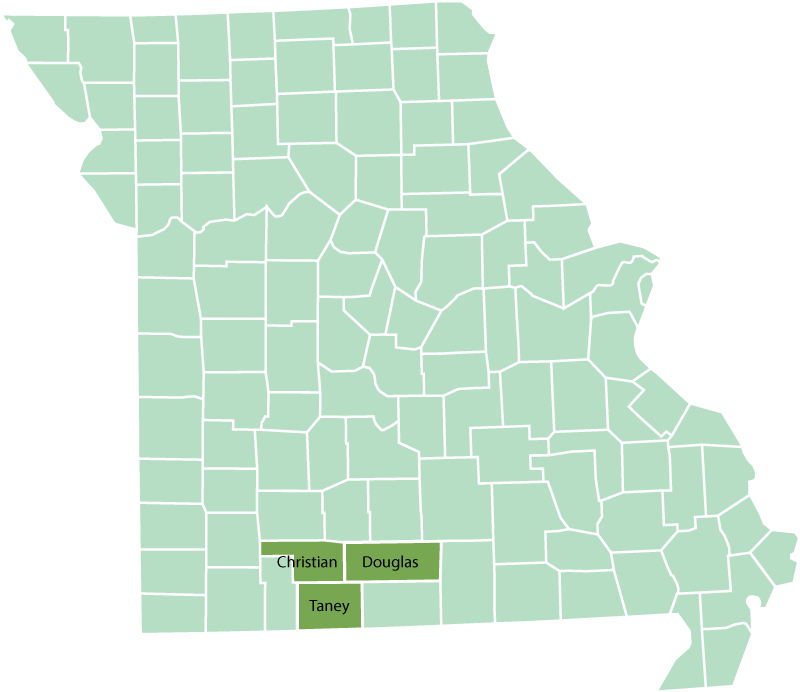 Missouri counties associated with the life of William Ivans and family. The Civil War Campaign Medal is considered the first campaign service medal of the United States military. The decoration was awarded to members of the United States military and Confederate military who had served in the American Civil War between 1861 and 1865. The medal was first authorized in 1905 for the fortieth anniversary of the Civil War’s conclusion. The Southwest Missouri bushwhackers were among the most blood-thirsty men of American history, including names such as William Quantrill, Bloody Bill Anderson and the James Brothers (the more famous brother was Jesse James). They unleashed mass murder, torture, massive destruction of property and terror on an unimaginable scale. In February of 1862 the Phelps’ regiment joined the Second Brigade, Fourth Division, Army of Southwest Missouri, under General Samuel Curtis. Their mission was to drive out the Confederate-allied troops of General Sterling Price, who occupied Southwest Missouri until March 1862. This would have been the period when William suffered the debilitating consequences of a long march (111 miles) over some four weeks in pursuit of Price’s men. This long trek was necessary because the railroad ended at Rolla, and so the only connection to Springfield was by marching and tending to supply wagons. 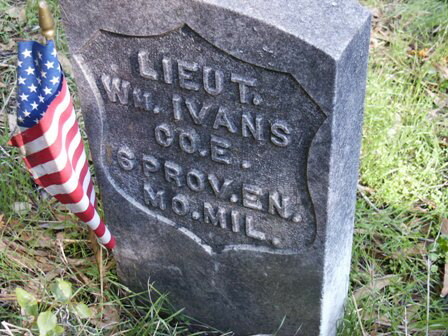 William Ivans and his fellow Missourians drove Price from Missouri, but then the pro-slavery forces turned back upon them at the Battle of Pea Ridge in Benton County, Arkansas, one of the major battles of the war (also called the Battle of Elkhorn Tavern).19 Pea Ridge was significant because it forced the Confederacy to realize they could no longer sustain their claim to Missouri and Arkansas, too far west from the heart of the South for scarce rebel resources. By this time William was already clearly debilitated. His fellow soldiers were likely in dire straits; while 25 were killed in action, 94 died of sickness.20 Yet they pressed on. Leading up to the battle the Missourians had a skirmish at little Sugar Creek, just over the Arkansas border, on 16 February. This was likely their first encounter with the actual Confederate military. 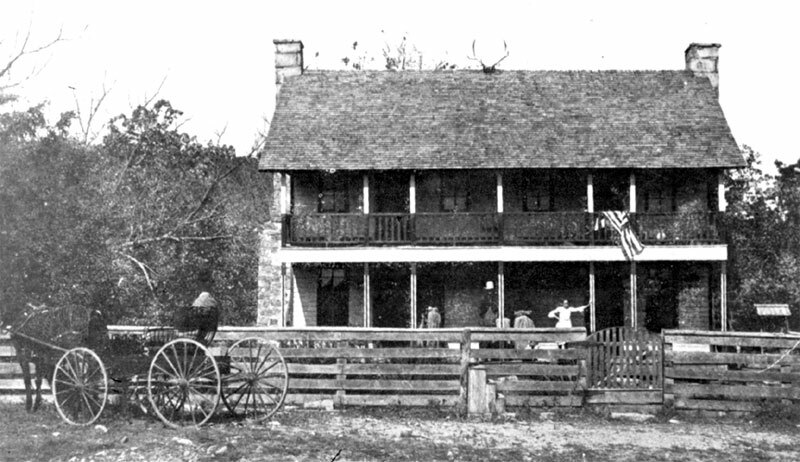 Then finally, on March 7 and 8, the 10,500 U. S. troops met 17,000 Confederates near Elkhorn Tavern, with the forested face of Pea Ridge serving as a backdrop. There are many detailed accounts, readily available, of what happened over those two days; suffice to say that when it was all over, 3,384 men lie dead on the battlefield. Most of the dead were Confederates, and many of the Confederates, Missourians. Report of Captain Josephus G. Rich, Phelps’ Missouri Infantry. DEAR SIR: I have just come in last evening from a scout. I learned that a party of rebels was on Fox Creek, some 10 or 15 miles from the Mountain Store. I started from here with Lieutenant Flint and 30 men; was re-enforced at Lick Skillet with some 30 Home Guards. Formed a junction on the head of Clark’s Creek, at Todd’s, with some 50 cavalry from Lebanon. Marched from there to the Mountain Grove Seminary. There we came on the rebels on Sunday, the 9th. The victory was complete. There was some 35 or 40 in number. We killed some 13, wounded 7, and took the balance prisoners. Among the prisoners were Colonel Campbell and Captain Holt. The captain was badly wounded. There was but one or two escaped that we know of. Not a man of us was hurt. Captain Co. B, Phelps’ Regiment Missouri Volunteers, Commanding Post at Marshfield, Mo. Most likely the new couple experienced considerable fear and hardship from the constant incursions of the Confederate guerrillas. Around the time William and Mary were married, the situation had become so severe that a draft was instituted of all men between the ages of 20 and 35 to constitute new state military units, called the Enrolled Militia, to combat the bushwhackers. The 73rd Regiment, Enrolled Missouri Militia began registering men between 10 July 1862 and 30 September 1862. This was a six-month, part-time commitment. It’s not exactly clear when William signed up for this new duty; his pension applications, completed decades later, seem to have dates that don’t quite line up with when the enrollment actually occurred. William was a lieutenant in Company F, headed by Captain Pleasant T. Green. Many men from Douglas County and Taney County made up this company. “The formation of the Enrolled Missouri Militia was an arrangement between [Major General] Schofield [of the Department of Missouri] and [Provisional Governor Hamilton R.] Gamble that had not received the full consent of the Federal authorities. As a result only a few would later be eligible for Federal pensions.”32 This is why, despite serving three tours of duty in the war, only William’s service in the Phelps infantry would later qualify him for a pension. 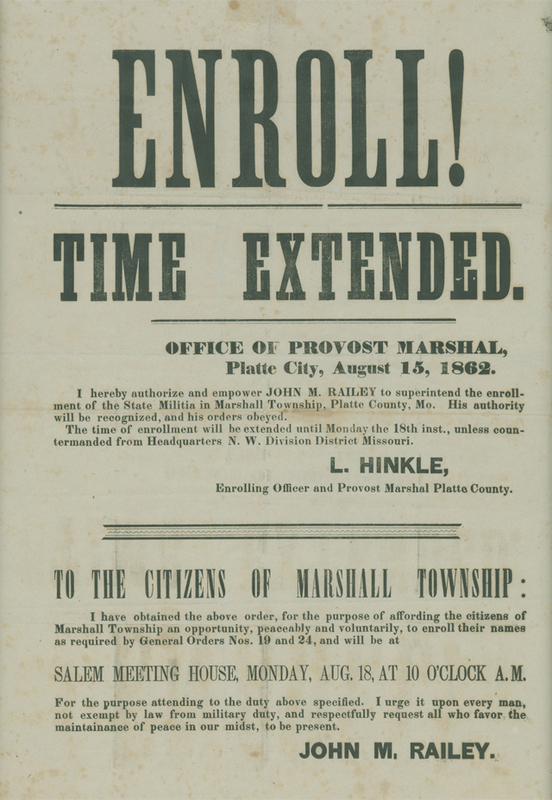 The 73rd Enrolled Missouri Militia was involved not only in ousting guerrilla bands, but also participated in the routing of the forces of Confederate Major-General John S. Marmaduke from Missouri December 31, 1862, to January 25, 1863.33 William would have been discharged by 28 November 1863. The Enrolled Militias were compulsory except for Southern sympathizers, who had to declare their allegiance to be exempted from service. But many Confederate supporters didn’t want to make their allegiance public, so they just joined the Enrolled Militias. As you can imagine, this made for a less-than-enthusiastic fighting force. As a result, Missouri instituted the Provisional Enrolled Militias, drawn from the most trustworthy members of the Enrolled Militias. Accordingly, in November 1863 William registered for Company B of the Sixth Provisional Regiment of the Missouri Enrolled Militia, at the age of 21, a resident of Campbell,34 where he served as a second lieutenant. Members of this unit would have been mustered out by no later than 31 October 1864. Probably William and Mary had hoped their life together would have started out less chaotic. But luckily William was out of the army in time for the birth of their first child, Marion Ballard Ivans, on 1 December 1864.35 Clearly he was named after his grandfather Ballard Green Wilson, but we do not yet know if the first name Marion was a tribute to another family member. Alice Laura Ivans followed on 25 March 186836 and William G. (G for Green, perhaps?) around November 1869.37 William does not appear with the family in the 1880 Census,38 when he would have been about 11, and there are not subsequent records of him, so it maybe that he died in childhood. At this time the family was living in Finley, Christian County.39 Finley no longer exists, but presumably it was at some point along Finley Creek in Christian County. There William seems to be prospering. No longer a farmer, he was then a miller, and owned $200 in personal property — worth about $3,600 in 2017 dollars. 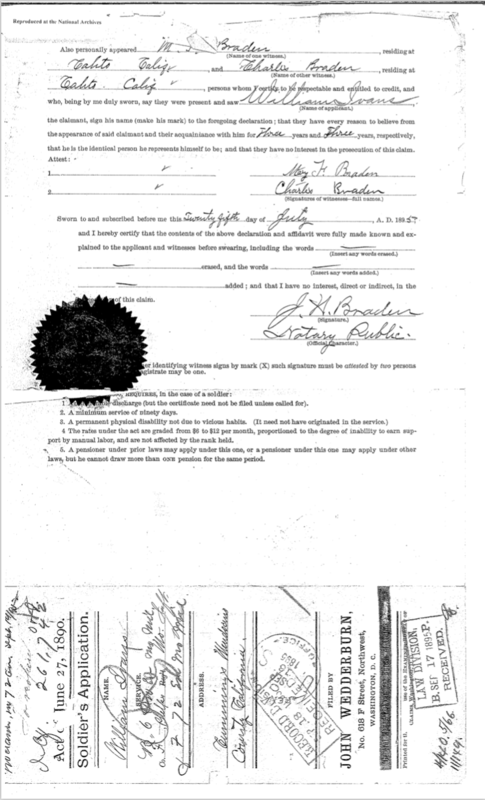 The Ivans family was in California at least by 1873, because we know that Cora Belle was born in California 12 March 1873.40 How did the family get to California? 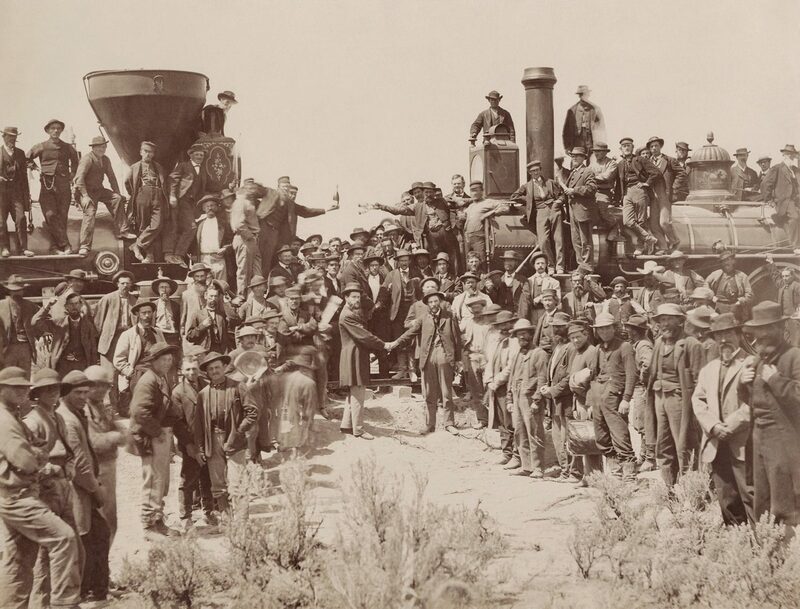 At the ceremony for the driving of the “Last Spike” at Promontory Summit, Utah, May 10, 1869, courtesy Wikipedia. Up to 1870, when we know they were still in Missouri, the usual way of migration to California would have been by wagon train, a grueling, dangerous and expensive 3,000-mile path across the plains and over mountains. 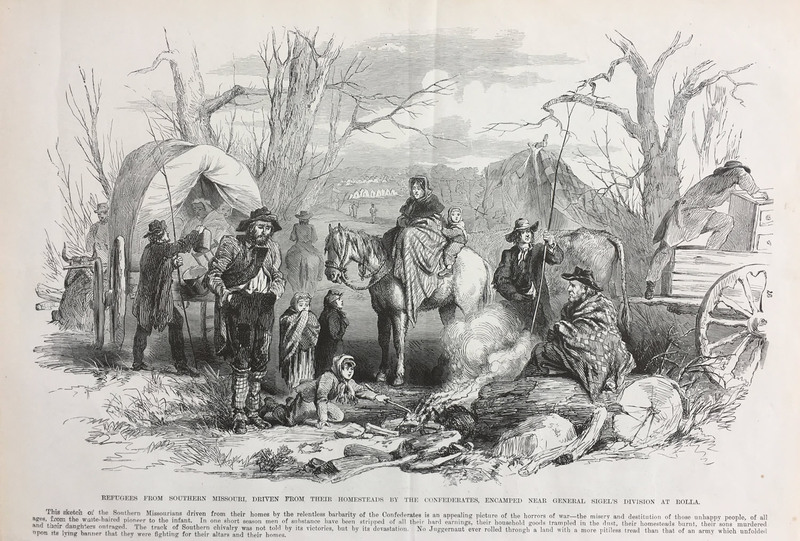 Most of those taking this path began their journey in Independence, Missouri, with the popular Oregon Trail or its offshoot the California Trail. 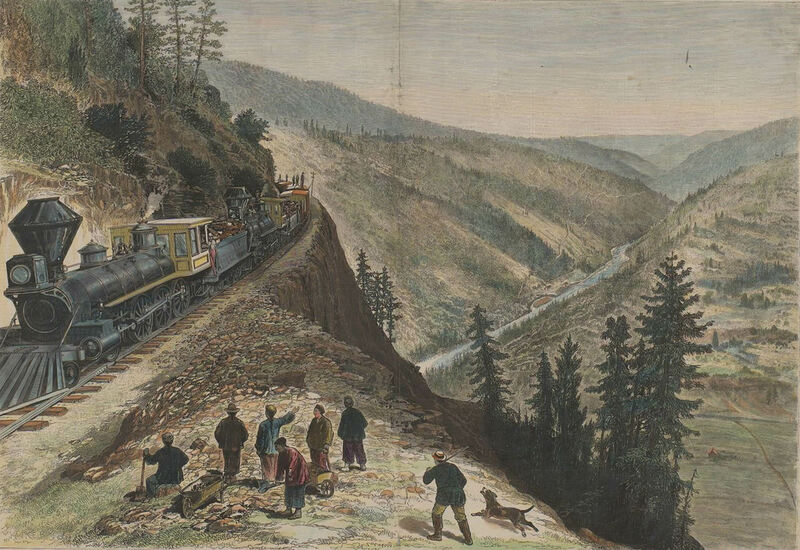 However, on 10 May 1869, the Union Pacific Railroad (coming from the east) and the Central Pacific Railroad (coming from the west) marked the connection by rail between the Eastern and Western United States at Promontory Point, Utah with the driving of a final Golden Spike. This made it possible to travel by rail from Omaha, Nebraska to Alameda, California in about four days.41 The fare was as low as $65 — about $1,200 in 2017 dollars. 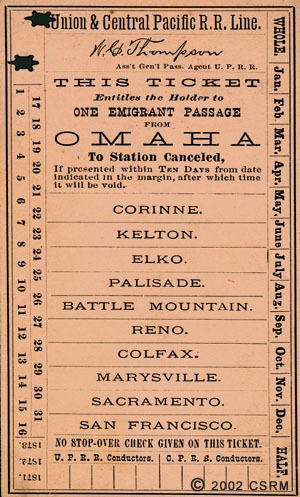 This was clearly a lot for a poor family, but considering it was a one-way “emigrant” fare, it was an outstanding value compared to a wagon train. 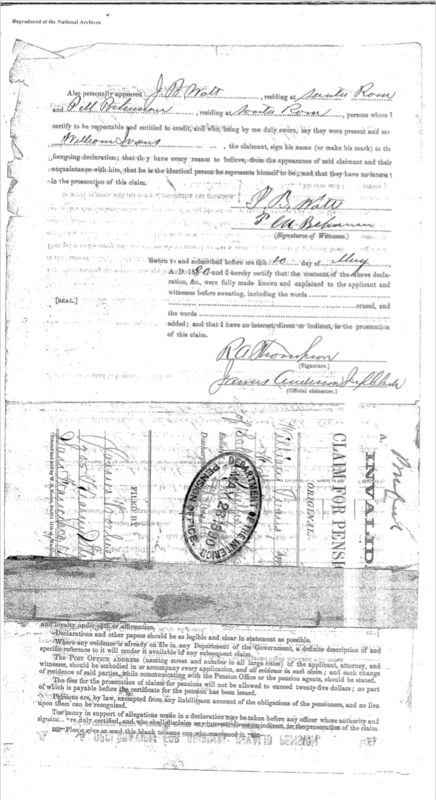 We know that William had assets of $200 at the time of the 1870 Census, so he could conceivably take his entire family on the journey (children rode free). Across the continent: the Frank Leslie transcontinental excursion, Horace Baker (1833-1918), engraver and Frank Leslie, publisher, 1878, Courtesy Online Archive of California. 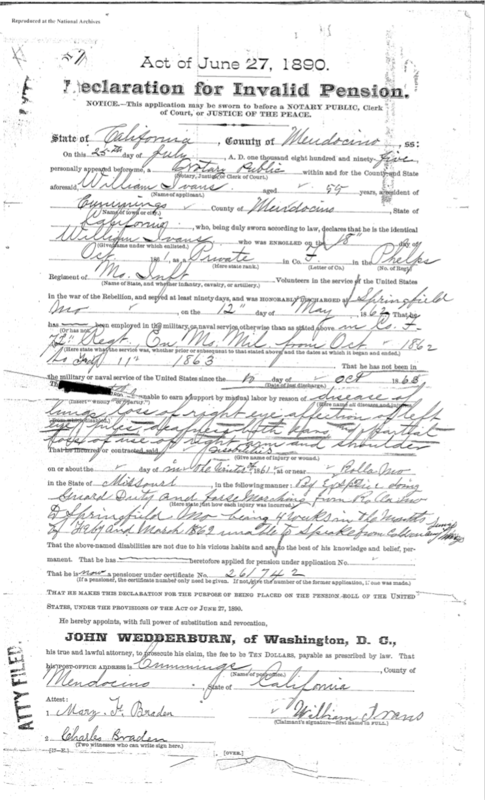 It was in 1880 that he first applied for an invalid’s pension for his service in the Civil War. 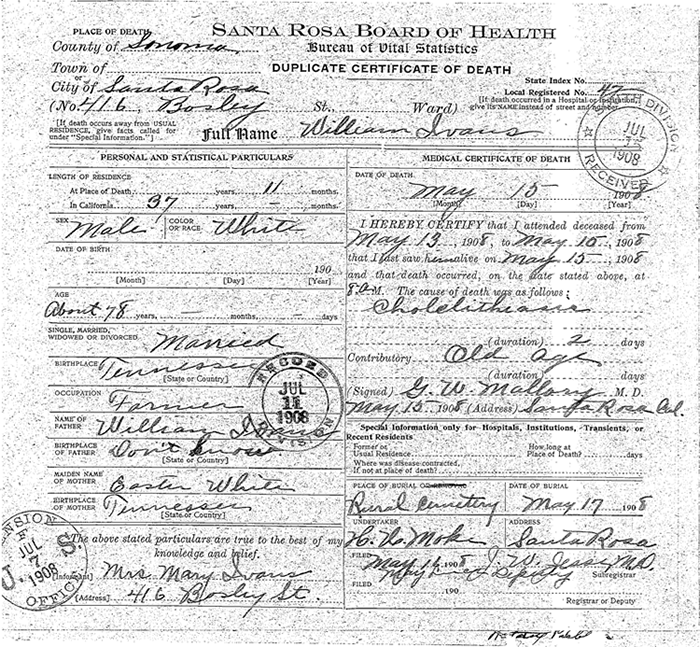 He was living in Santa Rosa and applied on 10 May. He was 37 years old, 5 feet 8 inches high, light hair and complexion and blue eyes. He was granted the pension. It’s not clear how much it was to begin with, but in November 1898 it was increased from $8 to $17—about $506 in 2017 dollars. He was living in Fort Bragg, Mendocino County, at the time of the increase.46 Cora Belle and Sumner Dunham’s third child, my grandfather Sumner Earl Dunham was born 23 April 1899 in Fort Bragg, so William and Mary may have been staying with the Dunhams (or vice versa). 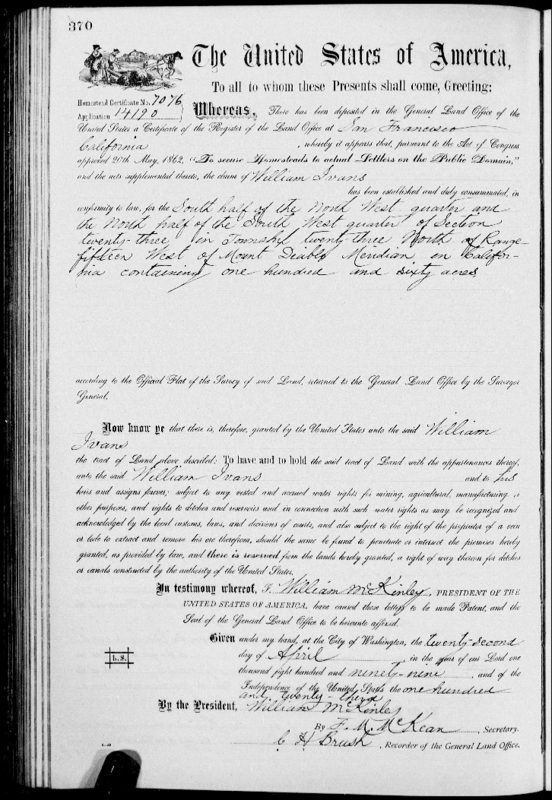 On 22 April 1889, William was granted land in Mendocino County.48 But it seems they didn’t take up residence there until around 1896; voter records show William registered in the interim in various places: Auburn in Placer County (1888), Calistoga in Napa County (1890), and Forestville in Sonoma County (1892), until he finally wound up in Blue Rock, Mendocino in 1896 and then in Ukiah, Mendocino County in 1900. 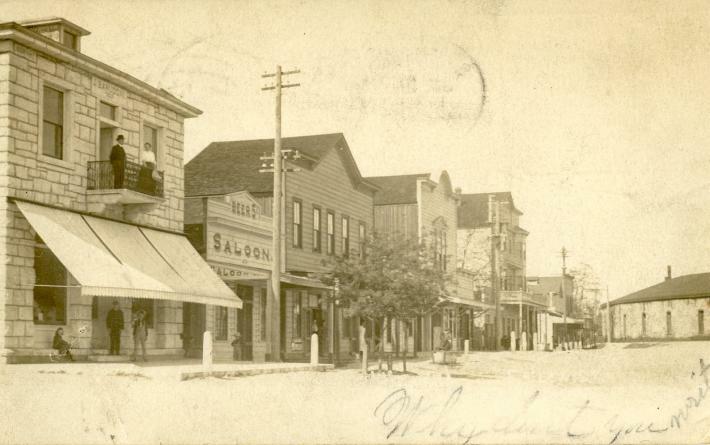 In December of 1901, William and Mary’s son John most likely caused great pain to the couple when he held up a stage coach between Fort Bragg and Willits.50 I’ve written about this elsewhere. William Ivans has moved to Santa Rosa. Mr. Ivans is a grand army veteran and a good neighbor. He will be missed from the community. William and Mary Ivans survived a terrible period when neighbor turned violently against neighbor. They fled the chaos only to find themselves at the mercy of the merciless. William did his part to make the situation better for everyone, but pretty much as soon as they could, they went to California, the land of promise, to bring up their children in peace. Their example may prove helpful to a divided nation that is increasingly becoming similar in many ways to what it was when William and Mary were young.